Sanford’s lemurs are medium brown and medium size, weighing 1.8-2.5 kilograms (about 4-5.5 pounds), with long tails. A whiskery “mane” distinguishes male Sanford’s lemurs, contrasting with the black nose, muzzle, and face. Females lack this creamy gray/brown beard and ear tufts. With their gray faces, females of this species resemble white-fronted brown lemurs. In Madagascar, Sanford’s lemurs range in tropical moist, dry lowland, and montane forests at the very northern tip of the island. They are found in Ankarana National Park and Montagne d’Ambre National Park. About 90% of the animals’ diet consists of fruit, supplemented by plant parts (leaves, buds, flowers) and centipedes and spiders now and then. Sanford’s lemurs are cathemeral, active day and night. Group size depends upon the population and habitat, with small mixed-gender groups (4-7) in rainforests and larger ones (up to 15) in the dry forests. Sanford’s lemurs share territory with crowned lemurs and sometimes forage with them. Researchers have not noted the female dominance characteristic of other lemur species. In Madagascar, Sanford’s lemurs reach sexual maturity at age 2. They mate in May and June, and 120 days later, in late September and early October, females give birth to a single infant. Like other brown lemurs, Sanford’s babies cling to the underside of their mothers for about a month before climbing onto their backs. Natural predators include hawks, boa constrictors, and fossae (the plural for fossa—a large, carnivorous mammal, related to the mongoose with qualities of a cat). Slash-and-burn agriculture, logging, and sapphire mining are destroying the northern forests. Locals sometimes hunt Sanford’s lemurs or trap them for pets. 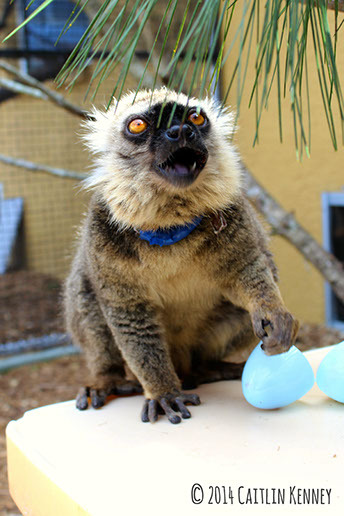 LCF shelters the only male Sanford’s lemur left in captivity in North America. In addition to the provided fruits, vegetables, and monkey biscuits, he browses gallberry, wax myrtle, and grape vines.